White men who exercise at high levels are 86 percent more likely than people who exercise at low levels to experience a buildup of plaque in the heart arteries by middle age, a new study suggests. Led by researchers at the University of Illinois at Chicago and Kaiser Permanente, the study looked at the physical activity trajectories of 3,175 black and white participants in the multicenter, community-based, longitudinal cohort CARDIA study, and assessed the presence of coronary artery calcification, or CAC, among participants. CAC is a clinical measure of the accumulation of calcium and plaque in the arteries of the heart. The presence and amount of CAC, is a significant warning sign to doctors that a patient may be at risk for developing heart disease and a signal to consider early preventive care. Heart disease is the leading cause of death for both men and women in the U.S. The study group consisted of CARDIA participants who self-reported physical activity during at least three of eight follow-up examinations over 25 years, from 1985 through 2011. At baseline, participants were ages 18 to 30 living in Birmingham, Alabama; Chicago; Minneapolis; and Oakland, California. Researchers categorized participants into three distinct trajectory groups, based on physical activity patterns: trajectory group one was defined as exercising below the national guidelines (less than 150 minutes a week), group two as meeting the national guidelines for exercise (150 minutes a week), and group three was defined as exercising three-times above the national guidelines (more than 450 minutes a week). “We expected to see that higher levels of physical activity over time would be associated with lower levels of CAC,” said Deepika Laddu, assistant professor of physical therapy in the UIC College of Applied Health Sciences. Instead, Laddu and her colleagues found that participants in trajectory group three, or those who exercised the most, were 27 percent more likely than those in trajectory group one to develop CAC by middle age. CAC was measured during the participants’ 25th year in the study using computed tomography, a CT scan, of the chest. At year 25, participants were ages 43 to 55. When these findings were stratified by race and gender, they found that white men were at the highest risk-they were 86 percent more likely to have CAC. There was no higher odds of CAC for black participants who exercised at this level, and while there was a similar trend for white women it was not statistically significant. According to Laddu and study co-author Dr. Jamal Rana, similar population-based cohort studies on cumulate exercise dose have caused some controversy by showing U-shaped trends of association between physical activity and disease risk. “So we performed this study to see if we can solve part of this puzzle,” said Rana, a cardiologist at Kaiser Permanente in Oakland. “Because the study results show a significantly different level of risk between black and white participants based on long-term exercise trajectories, the data provides rationale for further investigation, especially by race, into the other biological mechanisms for CAC risk in people with very high levels of physical activity,” said Laddu. 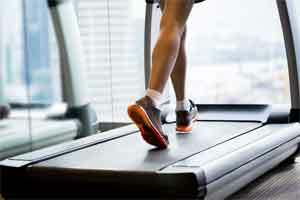 “High levels of exercise over time may cause stress on the arteries leading to higher CAC,” said Rana, “however this plaque buildup may well be of the more stable kind, and thus less likely to rupture and causes heart attack, which was not evaluated in this study.” Rana says they plan to evaluate for outcomes, such as heart attacks and death, next. While the study suggests that white men who exercise at high levels may have a higher burden of CAC, “it does not suggest that anyone should stop exercising,” Laddu said. The findings are published in Mayo Clinic Proceedings.